So Blood Meridian took me longer to get through that I was hoping. Evidently audiobooks are not something that I get on with. I've been looking to read some of Cormac McCarthy's ever since seeing the film adaptation of No Country for Old Men, cliche as that may be. It was such an odd film that I was curious to see how much of that was the Coen Brothers' direction and how much was from the original source material. 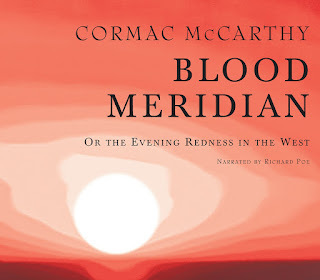 But I got my hands on Blood Meridian first, so that will have to be my introduction to his works. 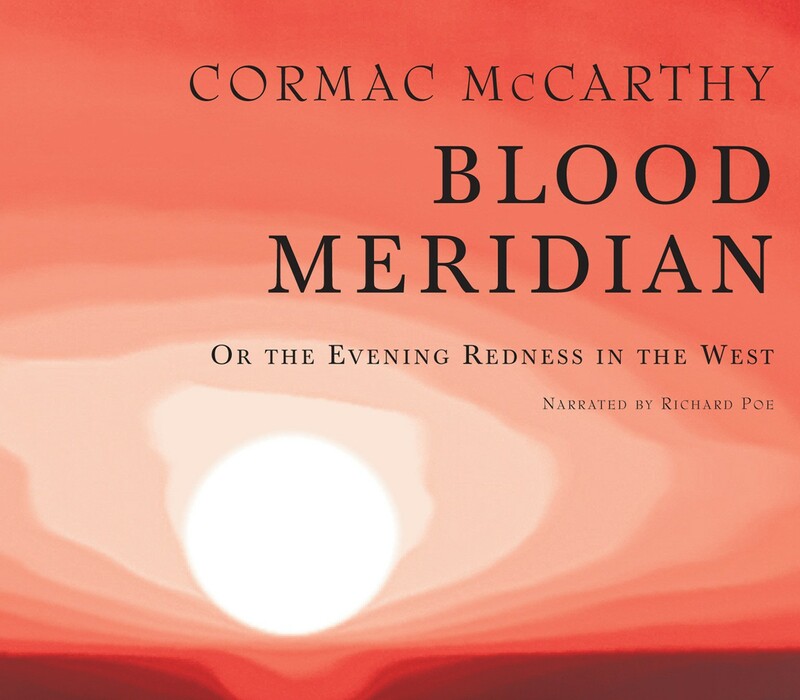 Blood Meridian follows a runaway known as the Kid during his violent coming-of-age as a member of a group of scalp-hunters, headed by the infamous John Joel Glanton and the eerie and erudite Judge Holden. As part of the Glanton Gang, he is tasked with collecting the scalps of natives attacking settlements at the Mexico-USA border. Right, so something quick to start the review off: if violence is not your thing, then Blood Meridian is not for you, as it comes up startlingly often and usually in a great deal of detail. If I were to guess, I would say that the majority of the narrative can be filed into one of three things: an act of mass and/or out-of-proportion violence, travelling in some truly wonderful descriptions of the landscape, or sitting around the camp-fire listening to the Judge preach about the world. Weirdly enough though, I found that the violence wasn't all that shocking. I have read that many readers who have gotten through to the end experience desensitisation, but it probably says something about me that, while the violence is vivid and utterly brutal, I just had a weird sense of dissociation. There was something about the stark nature of the writing style and the bleak, lawless setting that meant that when the violence did come along, it just felt like a natural extension. It didn't feel as shocking to me as, for example, Chuck Palahniuk's violent scenes, which stick out because they're meant to be set in modern day and contrast with mundanity. The thing that really stuck out for me was the Judge's speeches, just because he's such a well-written Devil figure. He is an unusual figure in pretty much every way compared to the company that he keeps, from his huge stature and arresting lack of hair, to the eloquence with which he completely runs circles around his uneducated travelling companions, to the obvious enjoyment that he takes in the violence that he inflicts as opposed to killing from necessity or for money. In addition to his unusual features, he seems to get a lot more spotlight than the nominal protagonist, the Kid, which gives the reader a better idea of his nature, if not his true origins. For me, I couldn't shake the idea that he was meant to be Satan, considering some of his actions appear to have no physical explanation at times, which gave the whole book a weird kind of Biblical parable feel to it. It felt like if new chapters of the Old Testament were written, but God never interjects as a guide, leaving the world to descend further and further into evil in their absence.